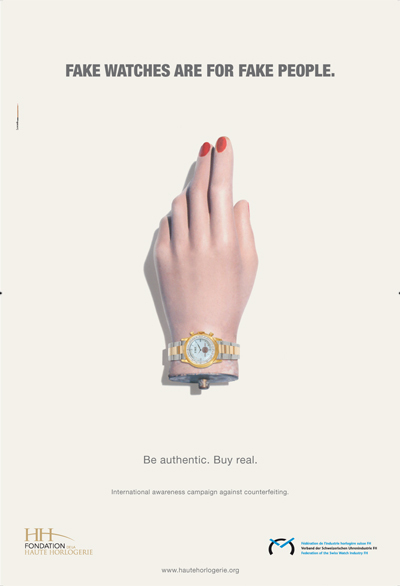 Anti-Counterfeiting Campaign at the SIHH: Fake Watches Are For Fake People! The Fondation de la Haute Horlogerie and the Federation of the Swiss Watch Industry are joining forces to launch an international anti-counterfeiting campaign. Their objective is to inform the public on the damage caused by this global scourge. In spite of the many efforts made, the problem of counterfeiting and piracy continues to wreak havoc on virtually every economy worldwide, and is expanding rapidly through multiple distribution channels, especially online. Calculations based on Customs seizures show that counterfeits and piracy worldwide amount to US$ 200 billion to 360 billion a year, or 5% to 7% of international trade. Swiss watches are no exception, as the sector is hit full-on by this modern-day plague. The Federation of the Swiss Watch Industry (FHS) estimates that over 40 million fake Swiss watches are made each year (compared with exports of almost 26 million authentic Swiss watches in 2007) and that they generate net profits of around one billion dollars. This illicit trade, whose main victims are the most prestigious Swiss brands, is equivalent to around 6% of total Swiss watch exports for 2007. In this context, it would be naïve to imagine that counterfeiting can be defeated simply by targeting the counterfeiters and their means of production. This wouldn’t be such a thriving industry without the individuals who buy fake watches, and who fail to realise the full extent of the damage they cause, in particular in human terms. The priority in the fight against counterfeiting must therefore be to speak directly to these potential customers and have them realise that what they believe is a harmless purchase has serious consequences on companies and nations. Legislative weapons and international measures still lack the impact to defeat this global scourge; hence the customers themselves must realise that wearing a fake luxury watch is empty of meaning. Counterfeiters increasingly target internationally renowned Fine Watch brands, whose reputation, capacity for innovation and sales all suffer as a result. These brands must also invest significant amounts in the fight against illicit copies in all their forms and to protect their intellectual property. As counterfeiting continues to spread, an even more serious consequence is the generalised loss of confidence in companies that nevertheless create jobs and added value. At national level, counterfeiting forces governments to invest heavily in the fight against fakes while losing out on tax revenues, and takes away employment opportunities. Finally, the phenomenal amounts of money generated by counterfeiting go on to benefit the mafias, criminal organisations and terrorist groups that reign over this illicit trade, where child labour is commonplace, and health and safety standards are openly flouted.